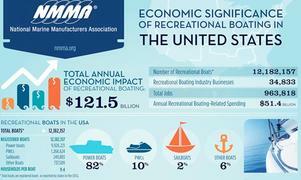 The National Marine Manufacturers Association (NMMA) has released an updated U.S. recreational boating industry economic impact report. Notably, the recreational boating industry has an impact of $121.5 billion in the U.S. annually; there are nearly 35,000 recreational boating-related businesses across the U.S. employing more than 338,000; and Americans spend $51 billion annually related to the 12 million registered recreational boats. The NMMA contracted with the Recreational Marine Research Centre at Michigan State University to update the 2008 Economic Value of Recreational Boating at the State and Congressional Level. The new report has been reformatted and is presented in user-friendly infographics, detailing the overall U.S. economy and then broken down by state. The data was presented during the American Boating Congress taking place May 8-9 in Washington, D.C. The full report is available to be downloaded as a pdf on the NMMA's website.